"71% - Protecting the Earth's Oceans"
71% of the Earth is covered by the oceans. Come join us to hear Corry Westbrook, noted world environmental authority and advocate, talk about ocean acidification, other concerns impacting the cleanliness and health of our oceans, and actions we can take to preserve this significant portion of our planet. 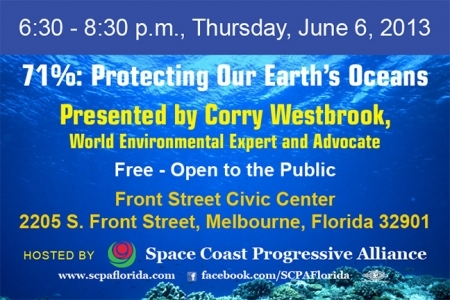 You are here: Home SCPA Activities SCPA 1st Thursday - "71% - Protecting the Earth's Oceans"